This picture has gotten a lot of response from friends that have seen all my photos, not just the few I have posted on the blog. I have received emails and comments like “it just draws me in – I don’t even know why”. I think it appeals to our imagination and curiosity. We wonder where this road will lead us, what is beyond those hills in the distance. 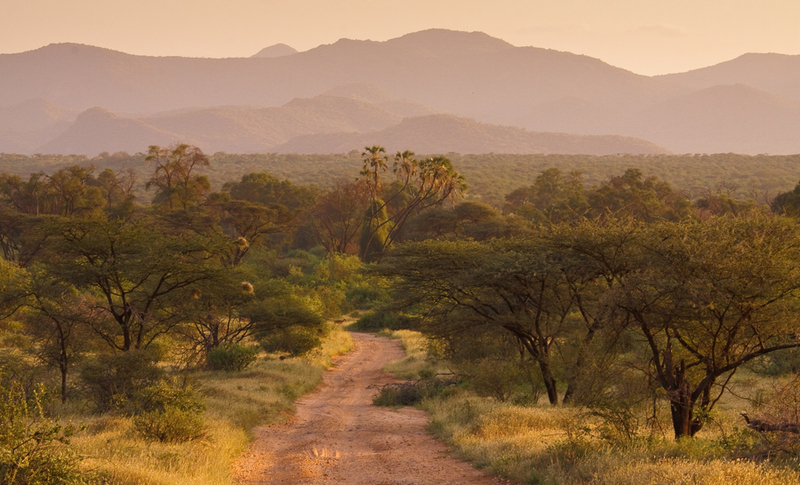 The picture was taken early evening in Samburu National Park on our way back to the lodge. And there could just be a little analogy to life here. A lot of us would not mind being able to see down the road a bit to see what is in store for us. There were certainly a lot of unexpected twists and turns on my road. Some I really could have done without, but some of them led to opportunities I might have missed otherwise. One of those revived my passion for photography a couple of years ago. I had always enjoyed photography (my father had given me a Minolta SLR for my 15th birthday together with a signed copy of a book on wildlife photography by Heinz Sielmann, a famous German wildlife photographer), but it has now become a much larger part of my life. Something that I would like to explore and develop much further. It will be a life-long journey. Sometimes it is better not to know what the road ahead will be like. You might be afraid to go ahead and miss out on some great experiences along the way. I had just finished writing this post (but not yet published it) when I learned about the floods in Samburu. I watched a video of the beautiful Samburu Serena Lodge (where we stayed), now greatly damaged by the flood waters. This lodge provided employment for the local community. It is hard to believe that Kenya just went through the worst drought in decades and now suffers from this flood. Even harder for me to believe is the fact, that there are still people who do not believe that climate change is real. I don’t know what it will take for them to realize that this is a reality. The evidence is everywhere. A beautiful image, Beate. I can see why it resonates with so many of us. The road to the Samburu was long and winding indeed but what a lovely place it brought us to at the end of the day.